Healthy Melrose Bike Ride on Saturday, May 12 – Bike to the Sea, Inc. UNFORTUNATELY, THIS RIDE IS CANCELLED DUE TO THE PREDICTION OF HEAVY RAIN. 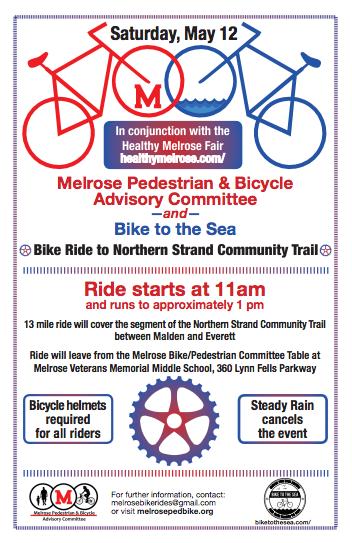 A 13-mile bike ride will take place from 11 a.m. to 1 p.m. on Saturday, May 12 as part of the annual Healthy Melrose Fair. The ride will take cyclists from downtown Melrose to the southern end of the Northern Strand Community Trail in Everett. Those interested in the free ride should meet at the Melrose Bike/Pedestrian Committee table at the Melrose Veterans Memorial Middle School, 360 Lynn Fells Parkway. Steady rain cancels the event. All riders must wear helmets.